Via The Audacious Epigone: IQ scores by US ethnic groups. It is not very useful I think in theoretical or practical applications but it is interesting as a showcase of why IQ is more than just genetic inheritance, incorporating also Flynn, sampling issues, sense of popular identity, selection bias, etc. 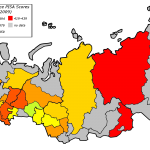 (1) Many of the Russians (about 50%) are, of course, Ashkenazi Jews. Explained. (a) As Ron Unz correctly points out, all other things equal rural people almost always score worse than urban people. Maybe rural life just isn’t as mentally stimulating. Almost certainly there exist strong dysgenic processes (every generation it is the brightest people who leave the farm). But this effect probably isn’t that strong as there are very few Americans still living on the farm today. (b) As I think hbd chick pointed out, some lineages are more prestigious than others. The Irish and Italians, in particular, are cool. In practice almost everyone in American cities is mixed to some extent. So even if someone is primarily Germanic, he might pass himself off as a Latino or Irishman. So the higher scores of most Italians, Greeks, Irish, Swedes, Norwegians, Hungarians, etc., etc., may well reflect the Germanic substrate more than anything else. (c) The Germans who came to America mostly came from the northern parts (e.g. the hamburger originated in… Hamburg). And various studies indicate that just as Germany is a genetically diverse nation by European standards so there are significant IQ differentials by regions. Generally speaking, the south is cleverer than the north. So, we have three major factors: The regional specifics of German immigration to the US; the greater relative prestige of “exotic” ethnic groups together with the “melting pot” culture of American cities; their greater share of the rural population. They may explain why ethnic German IQ in the US is fairly low relative to other European population groups. (3) The Dutch are especially low, though I suppose that this could be partly accounted for by the fact that a substantial number of them are Pennsylvania Dutch, i.e. Amish. They reject modern technology. Presumably, the Flynn Effect isn’t strong in them. (4) The Spanish are presumably a mix of real Spaniards (with IQ’s typical of the other Med nations – around 98) and Mexicans (who have an IQ somewhere in the mid to high 80’s, as a result of Amerindian admixture as well as some degree of under-development). They are thus exactly where one would expect them to be. (5) White “Americans” are typically Scotch-Irish in the Deep South. Here there is an element of self-selection bias because they are people who either forgot or don’t care about their ethnic origins. I.e., rednecks. (6) Africans score a respectable (by US black standards) 89. Probably because African immigrants tend to be far above the African average. They are also those people who didn’t answer “American”. Of the “Americans”, more than half are black. Since the white “American” average is 94, and the “American” average 89, that means that the black “American” average should be something like 85. I don’t know how many black “Americans” and “Africans” there were relative to each other but at a minimum we can say that the average for this group is in the 85-89 range. This is exactly coincident with all other conventional estimates. (7) The Swiss scores are not surprising. They are a very intelligent people. The Austrians might be something of an outlier as I imagine their sample size is quite low. Also the dumber Austrians may have identified themselves as Germans. (8) All the other ethnic groups appear to be more or less where we would expect them to be based on the performance of their original home countries.